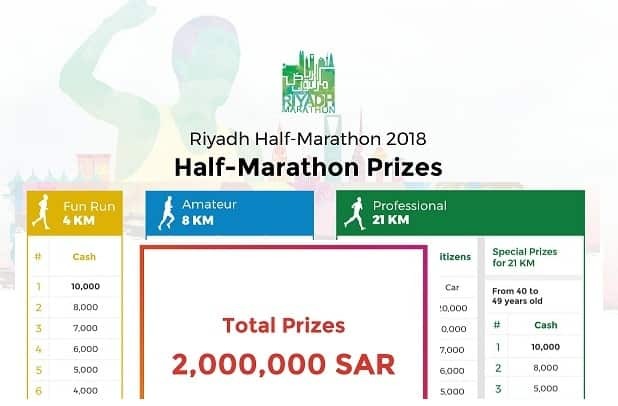 Riyadh's 1st official Half Marathon brings prizes worth 2 Million Saudi Riyals, The event is on 24th February 2018 and it is open for both citizens and expatriates of all age groups. The Riyadh Half Marathon will be in 3 categories, Professional Run, Amateur Run and Fun Run, Online Registrations are open till 20th Feb 2018, Mobile and On site registrations till 24th Feb 2018. 1. Professional Run : It is for professionals and the distance to run in this category is 21 Km, It starts on 1 PM from King Saud University, The minimum age to qualify for this run is 18 years. 2. Amateur Run : The distance to run in this category is 8 Km, It starts on 3.15 PM to Athletes with disabilities and 3.30 PM for all others, It starts from Kind Saud University, The minimum age required to register in this category is 15 years. 3. Fun Run : This category is open for all, The distance to run here is 4 Km, It starts on 4.30 PM at King Saud University, All age people are welcome in this category. - All participants will receive medal, Each category will have 10 prizes and accolades. Prizes distribution ceremony will be on same day after Isha prayer. - On online registration, Runners will receive an email with information to activate, They need to be present at start points at least half hour before the race begins, Runners can collect their bibs and running numbers at King Saud University Stadium at 21st, 22nd and 23rd February from 4 PM to 11 PM.